Ever wondered why the exact same product has a higher price tag when it is packaged in a pretty box for the Christmas season, decorated with lots of hearts and kisses for a Valentine's Day gift, or simply because it is served in a high-end restaurant that presents it on an artfully arranged plate? Well guess what? You are paying for the presentation! I recently went to a mall which had both Sushi Zanmai and Pasta Zanmai outlets in Kuala Lumpur, Malaysia. For those who know it, and to those who don't, these two seemingly different restaurants are owned by the same company. Sneaky but smart business strategy, if you ask me. As I was searching for lunch at that moment, I walked around the mall and found Pasta Zanmai on the fourth floor of the mall. 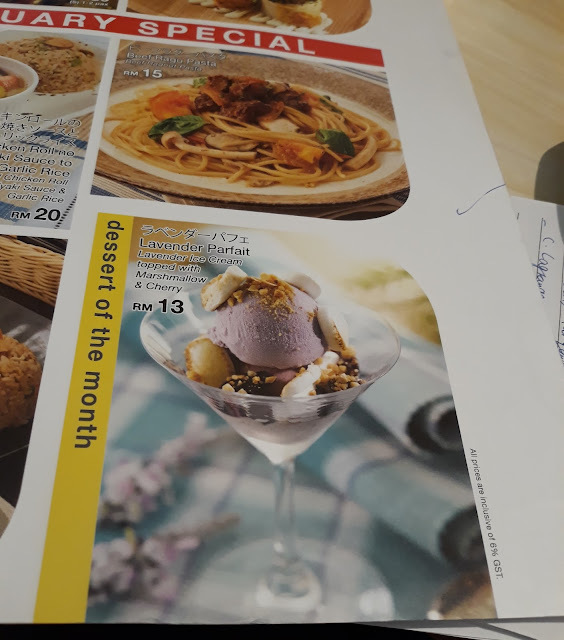 Taking a look at their menu, right at bottom right corner of their January promotion was a dessert they called "lavender parfait", priced at RM 13.